It’s official! This summer, Mickey Rourke’s Projectionist will unleash 100 years of nightmares onto a silver screen that never forgets. 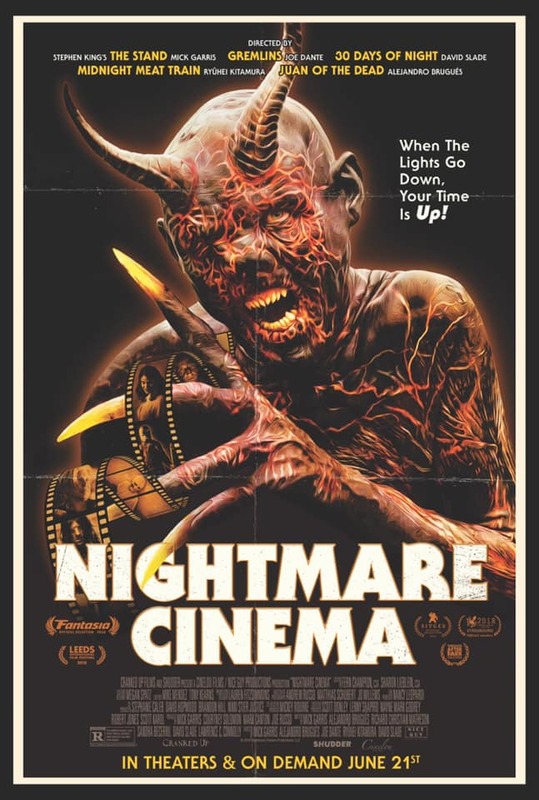 According to Cranked-Up Films, the new feature Nightmare Cinema will be released to theatres and on demand on June 21. Rourke plays the projectionist, and the shorts he shows are Dead, written & directed by Garris; The Thing in the Woods, written & directed by Brugues; Mirari, which Dante directs from a script by Richard Christian Matheson; Mashit, directed by Kitamura and written by Sandra Becerril; and The Way to Egress, an adaptation of Lawrence C. Connolly’s short story Traumatic Descent, which Slade directs from a script he wrote with Connolly. You can check out the official trailer below, then stand by for more details on the theatrical premiere of the film that has been called one of the most anticipated horror films of 2019. Connolly-Davis Band & The Wild Geese! Next Saturday, over 200,000 revelers are expected to pack Pittsburgh’s streets for the annual St. Patrick’s Day Parade. That’s in the morning. But after the parade runs its course, the place to be will be Riley’s Pour House, where live bands will perform all day and into the night for some of the best people this side of the Blasket Islands. The music will play for two days, running concurrently on two stages – one inside the pub, the other under the big tent. Saturday night will feature The Wild Geese under the tent and The Connolly-Davis Band in the pub. 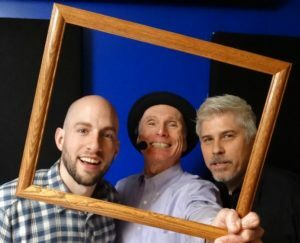 The music will continue on St. Patrick’s Day, with Connolly-Davis performing under the tent with special guest Brendan Kuntz of String Theory. I’ll post more details when Riley’s unveils the full roster of entertainment. In the meantime, I’ll hope to see you at 215 East Main Street in Carnegie for the best two-day St. Pat’s bash ever. It’s gonna rock! Sláinte! The Connolly-Davis Band with Pace Petrella, Lawrence Connolly, Duane Davis. The Wild Geese Band performs under Riley’s Big Tent on St. Patrick’s Day, 2018. It didn’t happen. Not then. But now – with an ever-increasing number of festivals and websites delivering quality shorts, the only challenge is finding the time to seek out the best. To that end, I have a few recommendations — some playing at festivals, others streaming on multiple platforms. 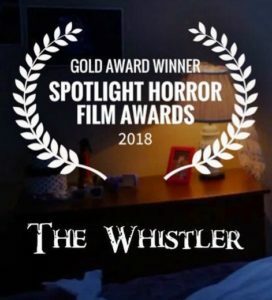 The first is “The Whistler,” a beautifully shot film that demonstrates how the threat of violence and the intimation of unseen horrors can be as chilling – indeed more chilling – than graphic mayhem and CGI monsters. The film opens with some standard horror tropes: a babysitter left in charge of a precocious tween and a sense of someone or something lurking in the darkness outside. But from there it veers into a weirdly surreal dreamscape that benefits nicely from exquisite low-light cinematography by Naim Sutherland and a moody score by Emmit Lee Stang. Written and directed by Jennifer Nicole Stang, the film had a terrific run on the festival circuit, winning over a dozen “best” awards, including Best Short at the New York City Horror Film Festival. If you were fortunate enough to catch it, Gruesome Magazine is giving you the chance to vote on its status as Best Festival Short of 2018. Also on the Gruesome Magazine ballot is “Heartless,” another festival favorite from the past year. This one presents a modern retelling of “The Tell-Tale Heart,” written and directed by Kevin Sluder, with Jennifer Sluder as executive producer. The Sluders bring Poe’s classic into the 21st century by re-imaging the story’s deranged narrator as a woman struggling to cope with the inequities of the corporate world. Although considerably more violent than the understated “Whistler,” this film’s blood and gore (expertly rendered by effects artist Josh and Sierra Russell and a crack make-up team) is always to a purpose. As a result, “Heartless” delivers over-the-top mayhem while managing to be about something more than gore — a satiric take on office politics. 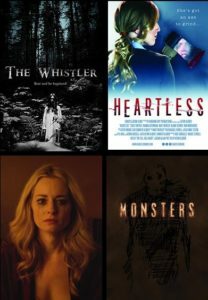 Like “The Whistler,” “Heartless” garnered numerous awards on the festival circuit, including the audience-prize at NYC Horror Film Festival in last month. Heartless Trailer from Sunshine Boy Productions on Vimeo. 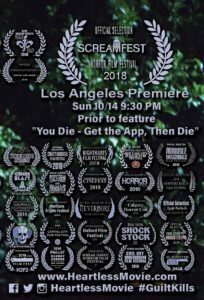 Among the many online sites currently streaming short films is Fun-Size Horror, which “aims to terrify and delight viewers with original short films that explore horror from every angle.” There you will find a seemingly endless list of flash films, including to my favorites: “Monsters” (directed by Steve Desmond) and “Midnight Clear” (directed by Joe Russo). Both feature the kind of writing that distinguishes the best of the original Twilight Zone episodes … and you can watch them both in their entirety by clicking the players below. Enjoy! And if you have any recommendations to share, please pass them along. You can listen in on that conversation by clicking the player above. If you like what you hear, there’s plenty more where that came from. 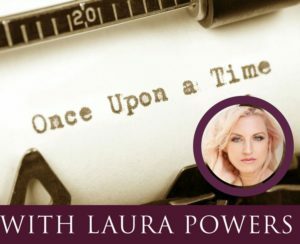 Our “From Book to Screen” episode is the latest installment of Write Hot, a podcast focusing on writers and writing. 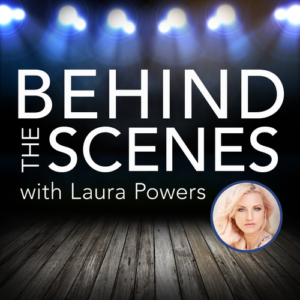 Additionally, Laura hosts the programs Healing Powers (health and wellness), Behind the Scenes (filmmaking and screenwriting), and Behind the Music (songwriting, music production, and performance), among others. 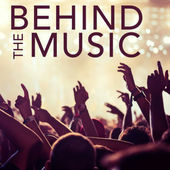 In “From Book to Screen,” Laura and I touch on the intersection between fiction and music — a topic that we’ll get the chance to explore in more detail when we sit down for a Behind the Music session (currently scheduled for next week). Should be a fun time. Other news: I’ve been in conversation with W.H. Horner Editorial and Design — the firm that designed this website way back in 2010. Web-content platforms have changed quite a bit since, and it’s time for an upgrade. Over the past few weeks, I’ve been making minor adjustments. The banner above now features display art by Jason Zerrillo (from Voices: Tales of Horror), and the media page has been enhanced with some new and redesigned content. In the days ahead, I hope to revamp the music page as well. But such tweaks will pale in comparison to what I have in mind for later this year. Big changes are coming. Look out 2019.